Commonly, where there is one termite or W.D.O. infestation, there are more atacking your home, deck, patio, ralilings, roof eaves, foundation or even on structural beams. Damage created by the different wood destroying organisms - like subterranean and drywood termites or fungi – can cause structural hazards in your home. The severity of the damage is influenced by many different factors which include the type and age of the infestation. Professional measures need to be taken in order to restore the integrity of the structure back to standard. All of our work is complemented with a no-charge similar paint match. We will leave the area with a professional finish so that your visitors can't even tell the difference. Every situation is different and every budget is different as well. Our structural repair options can accommodate to all different types of situations to assist you in completing the needed repairs in your house. Ask your licensed inspector what are the different options available for your specific case. Our structural repairs are approved by most lenders including those issuing VA and FHA loans. We constantly work in this type of situations and our staff is familiar with the required standards that will assist you in closing your escrow with no inconveniences. Is the damage created by these wood destroying organisms in areas with custom cuts? Our repair crew is equipped with the tools required to make a large number of different custom cuts. This will retain the cosmetic look of your house while restoring the structural integrity of the wood member. Here at GC Termite Control we know that getting rid of the wood destroying organism is only the first step. WDO's include Termite, Fungi, Wood Boring Beetles, and Carpenter Bees among others. Depending on the type of infestation among other factors like time, humidity, etc. will cause cosmetically damage or structural damage in the property which many times need to be repairs to maintain the integrity of the structure. From repairing a patio railing to repairing your structure foundation our GC Structural Repairs Crew will be able to take care of your problem. Each one of our specialists has gone through an extensive training to assure that they can manage any situation. 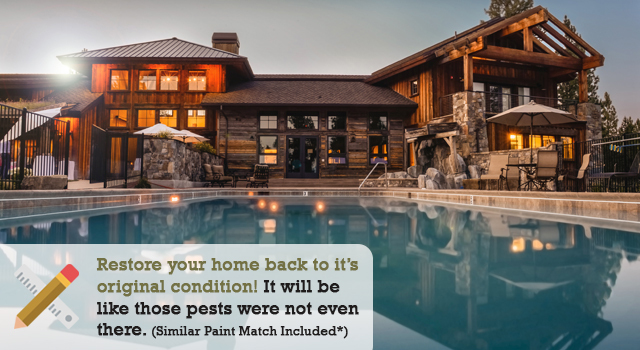 Many times there is an organism like termites will cause extensive damage on a property when the infestation is allowed in the property for an extensive period of time. There are times where on raised foundation properties because the owner has not gotten an inspector gone and checked the property correctly, termites where eating the house subflooring and one day because the wood was left hollow it was not able to support the weight and the floors started to crumble and break apart. To fix something of this extent a complete restructuring of the subflooring had to be made which left the home owner in a big economic dilemma. For that reason every property owner should have their structure checked at least once every two years this will save him thousands of dollars in the long run. Termite damage is known to cause billions of dollars each year of costs to home owner, don't wait to be a part of the statistics and take care of your problem before it happens. Structural repairs are very small and thus affordable when the infestation is taken care appropriately. Costs increases exponentially as time passes by as the damage from the wood destroying organism's increases too. Click Here To Schedule A Free Termite Inspection Online or Give us a call to (619) 421 – 2101 and we will gladly assist you in scheduling one for you.